​Australia is partnering with Papua New Guinea’s private sector to help local agriculture businesses find markets for their unique products. Recently, 26 participants of the Australia Awards Fellowships were in Port Moresby preparing for studies in agribusiness. The course will enable participants in the agriculture and production horticulture industry to develop business skills to support growth and productivity. At the workshop, participants discussed business plans, supply chains, product commercialisation and marketing principles for their organisations. They also completed workshop site visits at Nine-Mile Farm, Duffy Cafe and Stop N Shop to learn first-hand what it means to manage a successful business. In May, the students will travel to Armidale in New South Wales to attend classes delivered by the University of New England in conjunction with RuralBiz Training. Joan Mondo, a participant from Pacific Balance Fund Agro Business Limited, said it was a privilege to visit the Nine-Mile hydroponics farm and Duffy cafe. “I learnt a lot about the facilities and how agribusiness worked for them and the challenges they face,” Mondo said. Speaking at a networking event hosted by Australia Awards, Australian High Commission’s Acting Counsellor (Education), Fuchsia Hepworth, said that Australia commends the invaluable work of rural businesses and entities. 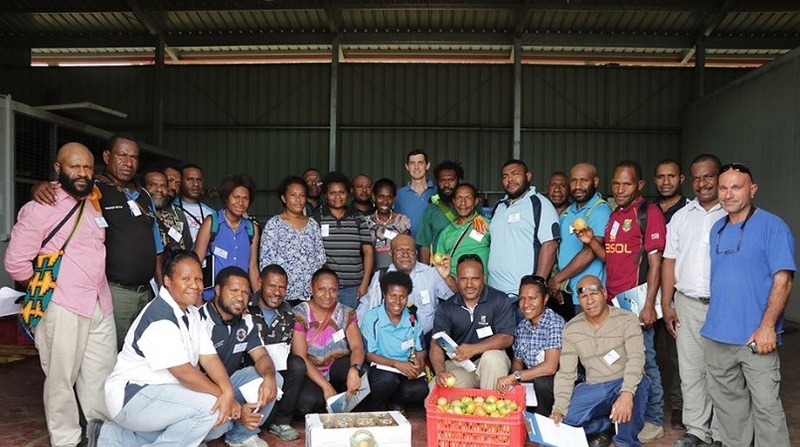 “Agriculture matters in Papua New Guinea and this Australia Awards Fellowship course is a demonstration of how Australia and Papua New Guinea are working together in partnership to strengthen Papua New Guinea’s agribusiness industry,” she said. Australia Awards assists the public and private sectors, as well as civil and non-government organisations, to develop the skills of working professionals in areas that the Papua New Guinea Government has identified as a priority.